We are in the last week of our holiday in Europe. In a week's time, we'll be home. As in previous years, after about three weeks, we start to looking forward to go home again. Even if it means to go back to scorching heat and humidity, as this is what we can expect at the end of August in Dubai. For the past few days, we have been visiting family and friends every day. I am very close to my family. As I am only going home once per year, I am ready to make the effort of seeing everyone, even if it is just for an afternoon. This sounds easier than it is. Especially for the kids it is quite a tiring task, and for my husband probably a bit boring as he doesn't speak German. Those visits, especially the ones to the older family members are usually accompanied by big meals and heavy German cakes. For the meals that we have by ourselves before or after a visit, my family particularly asks for something light. I love meals that don't require a trip to the grocery store and that can be whipped up in just a few minutes. We are usually stocked up on a variety of vegetables, no matter where we are. On a few rainy days here in Germany, I made us hearty vegetable soups without having to leave the house. 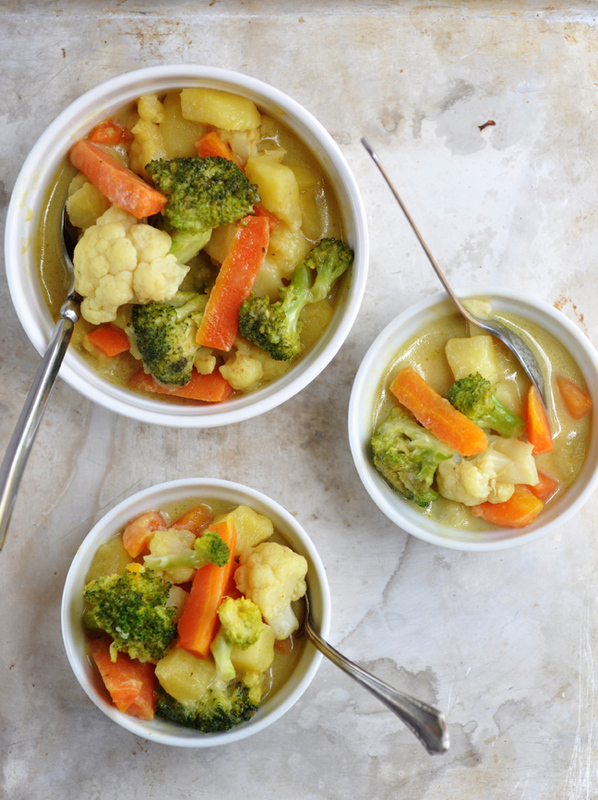 This vegetable curry has been on my favorite list too, ever since I used it to clean out the veggie shelf in my fridge before our holidays. Quick and easy, light on the stomach, very satisfying and extremely healthy as the veggies as well as the spcies have an anti-inflammatory effect on the body. Enjoy! Cut vegetables evenly into bite sizes. Heat the oil in a skillet over medium-high heat. Add ginger and spices and fry for a few seconds until fragrant. Add vegetables and saute for a few minutes. Add the coconut milk and simmer for about 10 minutes, or until the vegetables are cooked. Serve immediately.